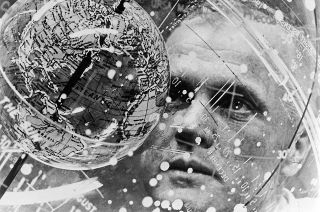 John Glenn looks into a celestial training device in preparation for his Mercury-Atlas orbital launch in February 1962. Glenn died on Dec. 8, 2016 at the age of 95. The same phrase that hailed John Glenn's historic launch into space more than 50 years ago became a social media hashtag on Thursday (Dec. 8), marking the astronaut's final departure from Earth. "#GodspeedJohnGlenn," read the tweets, status notes and photo captions as the news spread that John Glenn had died at the age of 95. "An inspiration to so many. #GodspeedJohnGlenn," British astronaut Tim Peake tweeted on Thursday. Almost 55 years earlier, on Feb. 20, 1962, fellow Mercury 7 astronaut Scott Carpenter radioed those same words to Glenn as he rocketed towards becoming the first American to orbit the Earth. "Godspeed, John Glenn," stated President Barack Obama. "Our nation has lost an icon, and Michelle and I have lost a friend." "We lost a great pioneer of air and space in John Glenn," President-Elect Donald Trump wrote on Twitter. "He was a hero and inspired generations of future explorers." Some of those who Glenn inspired became his crew mates on his second spaceflight, 36 years after the first. "Mourning the loss of one of the greatest, kindest, & most humble Americans of our time," tweeted Scott Parazynski, who in 1998 launched alongside Glenn on board the space shuttle Discovery. "Godspeed, John Glenn." "[We were] honored by his presence when Glenn trained as a crew member on STS-95," said Ellen Ochoa, director of NASA's Johnson Space Center in Houston and the first Hispanic woman to launch into space. "Our nation has lost a pioneer who contributed immensely to human spaceflight and inspired so many." "I had just turned 13 when I watched John Glenn become the first American to orbit the Earth," stated Bob Cabana, a shuttle-era astronaut and the director of NASA's Kennedy Space Center in Florida. "John [Glenn] epitomized what it was to be a Marine, a pilot, and an astronaut, and he was one of my heroes." "I join that crowd of people and the entire nation and the world in paying homage to his service," Apollo moonwalker Buzz Aldrin wrote in a statement on his website. "I am very sorry that he has departed us with his wisdom." The news of Glenn's death reached all the way to space. Astronaut John Glenn with NASA Administrator Charles Bolden at a NASA Future Forum in 2012. "Saddened by the passing of John Glenn," tweeted NASA astronaut and Expedition 50 flight engineer Peggy Whitson from orbit onboard the International Space Station. "This is a tremendous loss for our nation and the world." Whitson, 56, became the oldest women in space when she lifted off for the station in November. Glenn set the overall record for the oldest person in space when he launched on Discovery at the age of 77. "The very definition of the 'Right Stuff,'" tweeted astronaut Jack Fischer, who will launch to space in late March. "John Glenn was a patriot, statesman and explorer whose impact will be felt for generations — Godspeed." Former astronauts and twin brothers Mark and Scott Kelly also took to Twitter to share their thoughts about Glenn. "My brother, Scott, and I had the fortune of getting to know John Glenn as he trained for his final mission at Johnson Space Center," wrote Mark. "Working with John Glenn was like a rookie playing baseball alongside [Babe] Ruth or like a kid getting music lessons while Mozart composed in the next room." "As we stand on the precipice of a new era of exploration to Mars and beyond, we do so on the shoulders of brave explorers like John Glenn," Mark Kelly tweeted. NASA Administrator Charles Bolden, also a former shuttle astronaut, expressed a similar sentiment in a statement. "[Glenn's] missions have helped make possible everything our space program has since achieved," said Bolden, "and the human missions to an asteroid and Mars that we are striving toward now." "John Glenn's legacy is one of risk and accomplishment, of history created and duty to country carried out under great pressure with the whole world watching. The entire NASA Family will be forever grateful for his outstanding service, commitment and friendship," said Bolden. See photos documenting astronaut John Glenn’s spaceflight legacy at collectSPACE.